As the application of genomic sciences becomes common in toxic tort litigation, savvy litigators are occasionally concerned that genomic information may backfire on the defense. Specifically, defense lawyers worry that plaintiff’s counsel may allege that an exposure to a minute amount of a toxicant caused an injury through an individual’s unique genetic pathway. This can be a valid concern under a very limited and certain set of circumstances, but in properly screened cases, knowledge of the plaintiff’s genetics can serve as a clear-cut advantage for the defense. To better understand the application of the science, one must understand the concepts of genetic predisposition and genetic susceptibility, including the crucial differences between these terms. Like any other complex genetically inherited trait (eye color or tolerance for lactose), disease predisposition and exposure susceptibility are determined by a combination of environmental, lifestyle, and genetic factors. In the following sections we describe the meaning of these terms and demonstrate how each argument may be made in toxic tort litigation. Genetic predisposition refers to the likelihood that an individual will develop a specific disease (e.g., cancer, birth defect, autoimmune disease) due to the genetic makeup they are born with. A genetic predisposition is inherited from the individual’s parents as gene variants that increase his or her likelihood of developing that disease independent of other environmental factors. An extreme example of genetic predisposition is cystic fibrosis. If an individual inherits specific genetic mutations from both parents, there is absolute certainty that these genetic factors will drive the development of the disease independent of any other factor (this is known as 100% “penetrance,” a concept that will be discussed in future posts). Not all genetic predispositions lead to the certain development of a disease. For example, a woman who inherits certain defective BRCA1 or BRCA2 gene variants has a very high (45 – 65%) probability of developing breast cancer compared to the 12% probability of women without these variants. No other genetic factor or toxicant exposure is necessary to drive the development of cancer if one of these gene variants is inherited. 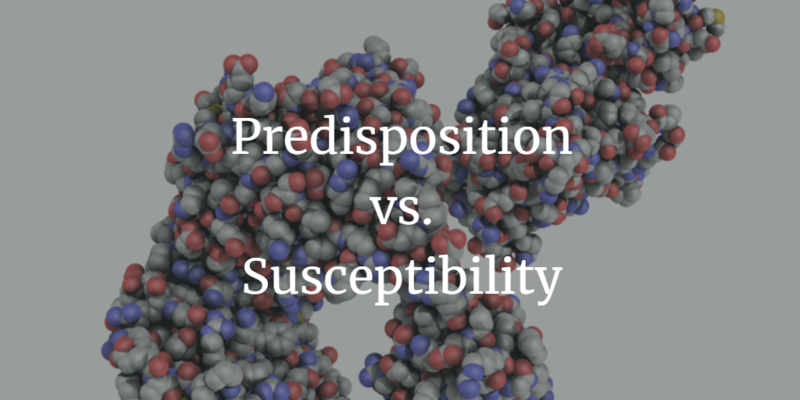 As can be seen from these examples, demonstration of a genetic predisposition empowers the defense to confidently point to specific, measurable genetic factors as a cause of an injury (in the absence of exposure to any alleged toxin). It is important to note, however, that genetic predisposition is not always a guarantee of disease; not everyone with a defective BRCA1 or BRCA2 gene will develop cancer. However, an individual who carries a defective gene is more likely to develop cancer than someone who does not carry a defective gene. And with certain gene variants and certain combinations, the odds can rise close to the point of certainty. Genetic predisposition is a powerful tool for defense litigators because it provides well-developed, science-based models for alternative causation as to how a given cancer occurred independent of a toxic exposure. “Genetic susceptibility” refers to an increased likelihood that an external factor (e.g., exposure to a toxicant) can cause an injury based on an individual’s genetic profile. For example, individuals with genetically determined lighter skin tones often have genetics that make them more susceptible to the adverse effects of UV radiation, which in turn, lead to an increased sunburn response. Whether or not benzene causes adverse health effects is another example of genetic susceptibility. Specifically, certain individuals inherit specific genetic variants that increase the likelihood that benzene will cause a variety of adverse health effects (i.e., headache, dizziness, drowsiness, and loss of consciousness following lower, acute exposures and acute myeloid leukemia (AML), anemia, or other blood disorders at higher, chronic exposures). If an individual with a genetic susceptibility to benzene were exposed to sufficient amounts of benzene, they would have a higher likelihood of developing AML and related blood disorders than someone without the susceptibility alleles. It is important to highlight that genetic susceptibility to a toxicant is the exception rather than the rule. In contrast to genetic susceptibility, most individuals actually have genetic resistance (i.e., the ability through protective measures or repair mechanisms to keep the body from being harmed by toxicants). Therefore, genetically determined responses to toxins are not limited to adverse outcomes (susceptibility). For example, some gene variants confer a neutral response (no allergy to gluten) and others can protect from the effects of exposure (HIV resistance). The important point is that we use the term “genetic susceptibility” to refer to the effects of a toxin that are modulated or modified by a person’s genetic profile. As a genetically determined response, genetic susceptibility is one side of a coin that may potentially provide an advantage to plaintiffs in toxic tort litigation. However, the flip side can provide an advantage to defendants. That is, well defined genetically determined neutral or protective responses to alleged toxicants can provide powerful arguments supporting the defense case that the toxicant was not involved in the injury. In a recent case, ArrayXpress, Inc. was able to demonstrate that the plaintiff had gene variants that are protective against benzene toxicity. These facts served to effectively rebut the plaintiff expert’s unsupported speculation that benzene caused plaintiff’s AML. The case was settled favorably for the defense. Toxic tort cases trying to make use of genetic evidence will hinge on whether the defense can demonstrate genetic predisposition (i.e., the plaintiff’s genes caused the injury independent of their toxic exposure) or whether the plaintiff can demonstrate genetic susceptibility (i.e., the exposure caused the injury in the context of the plaintiff’s genes). The relationship between an individual’s genetic makeup and its outward manifestation – i.e., whether the genetic profile confers disease predisposition or susceptibility or both – is complex and can be influenced by multiple factors. On the one hand, animal studies support the view that there may be genetic susceptibility to the carcinogenic effects of certain forms of asbestos. On the other hand, vast numbers of mesothelioma cases among people with no documented asbestos exposure (often families with a history of related cancers), support genetic predisposition. It is critical to note that many current day mesothelioma cases — especially young women presenting with peritoneal mesothelioma — have no documented asbestos exposure, a fact that strongly supports genetic predisposition. Likewise, tissue banks have embryos with mesothelioma. These data show that mesothelioma, like other cancers, has a purely hereditary component and stands in contradiction to the view that mesothelioma is a signature disease caused only by asbestos exposure. Specific genetic drivers for this predisposition are being discovered at an increasing pace using high-throughput genome sequencing technologies. Therefore, evidence for genetic predisposition in mesothelioma is increasingly common as the number of unexposed mesothelioma cases increase over time. When confronted with defense arguments of genetic predisposition (i.e., plaintiff’s genes caused the injury) plaintiff counsel may attempt to counter with susceptibility arguments – i.e., the toxicant caused the injury through plaintiff’s genetic sensitivity. Nevertheless, we have found that demonstrating genetic predisposition is an extremely powerful counter to this approach and whole genome sequencing can be used to generate the relevant data in individual cases. ArrayXpress Inc. has successfully used genetic predisposition arguments in many cases. Showing a lack of susceptibility, or even resistance, makes the cases even stronger. At the end of the day, genomic techniques can be used to assess whether an individual has predisposing variants, susceptibility variants, or resistant variants and arguments in the courtroom will be guided by these genomic findings. Future posts will further detail specific examples of genetic predisposition/susceptibility and how additional external factors can interact to effect disease development. Portions of this post were previously published in a previous article. To learn more about how you can implement genetic and a systems biology analysis in your case(s), please fill out the form, below.